In modern workplaces, we often find ourselves working on projects or creating documentation alongside external companies. Whether that’s a creative agency, a product supplier or one of your own clients, the chances are, you’re going to be presented with multiple file formats. That’s why we’ve decided to cover all the different ways you can work with Office files in G Suite. Historically, juggling different formats could have been an issue, as nobody would be willing to pay for multiple different software licenses that are designed to provide the same (or similar) solutions. One of the most common file types out there is Office files i.e Word, Excel and Powerpoint. Lots of businesses want to gain the collaborative benefits of using Google Drive, Docs etc. but also need to face the reality that a lot of work will involve these Office formats at some point. Thankfully, it’s now easier than ever to work with Microsoft Office files in G Suite. 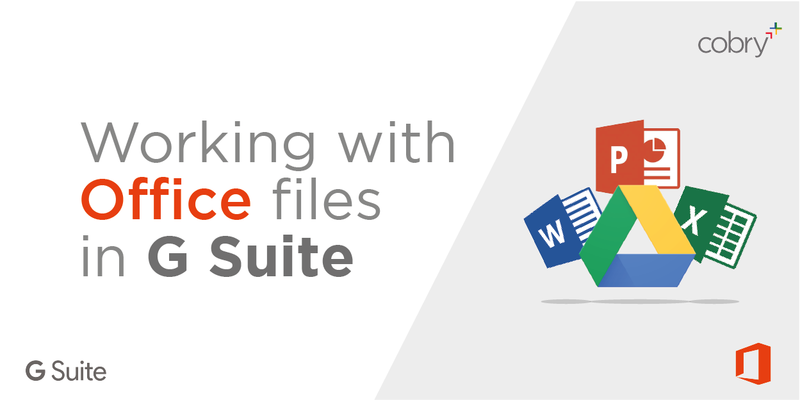 When we move companies to G Suite we always advise them of the various easy ways to address this, so we thought we’d set out below the many ways Google help users to work with Microsoft Office files in G Suite. We will also cover one of G Suite’s latest features; how to avoid version conflicts in Office formats within Google Drive. This is an incredibly powerful function that makes it even easier when working with Office files in G Suite than in Office 365, as at the time of writing, this functionality isn’t provided within Office 365. Save or upload your office file to Google Drive. Tick the box that says “Convert uploaded files to Google Docs editor format”. 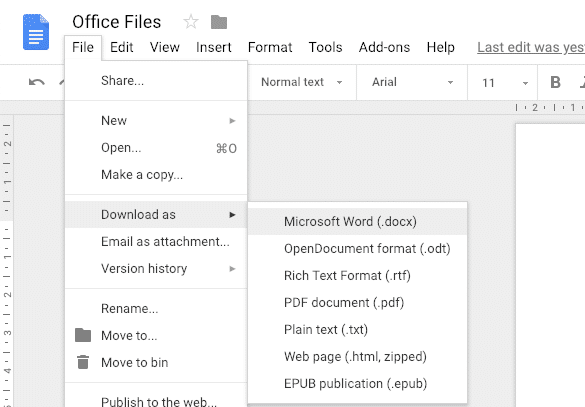 Now, when you upload any Microsoft Office files like Word, Excel or Powerpoint, they will automatically convert to Google Docs, Sheets or Slides to allow for instant editing and real-time collaboration. Open the file you want to convert to Word format. Click File > Download as > Microsoft Word (.docx), Microsoft Excel (.xlsx), or Microsoft PowerPoint (.pptx). Docs will open a “Save As…” window where you can select where you want to save the document. Once saved, you’ll be able to open the file in Microsoft Word. When in Google Drive, it’s even easier to convert files – Simply right-click on the file and click “Download.” Drive will automatically convert it to an Office format and open a “Save As…” window to save it. If you hold down the CTRL/CMD key when you click on files, you can select multiple files at once. The selected files will light up blue: then, right-click any of the highlighted ones and click “Download” to convert. You can also comment directly on Microsoft Office files, PDFs and images, the same way you would with Docs, Sheets and Slides, without converting them to Google formats first. Highlight areas of interest and click the comment icon. Type any notes, assign tasks or mention colleagues using @ in front of their name, the same way you would with Google formats. Your co-workers can still reply back as usual, even if they’re not using G Suite. So if an external team member opens your Microsoft Word document on their Windows PC, they will see your comments and can reply within Word. If you’re working with an external team who use Microsoft Word, Excel and Powerpoint, you can still edit and work with these files without converting or even having Office installed. Open Google Drive, then open an Office file. The file will open within in Docs, Sheets, or Slides, however, it will use the Office extension to maintain the same Office format. Any changes you make will be saved in the original Office format. You can then choose to save each file either in its original Office format or convert it to Google Docs, Sheets or Slides to enable collaboration features. If you haven’t already, we recommend that you install Drive File Stream on your computer. Drive File Stream is a cloud file synchronisation tool that lets you stream files from My Drive and Team Drives from the cloud to your computer. This means you can access your Google Drive data in the same way you access the data stored on your regular hard drive. In Office, click File > Open and find your Google Drive folder. Select your document file and click Open. Edit your file. Any changes you make to your file in Office sync in Drive. You can also save a new Office file to your Drive folder, which will then sync to the cloud. 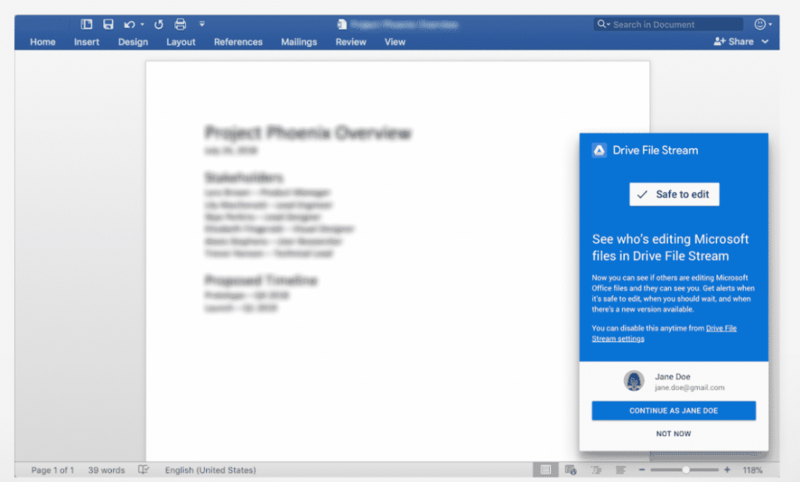 When you open a Microsoft Word, Powerpoint or Excel document from Drive, G Suite will check if anyone else is currently editing the document. You will then receive a notification to let you know if it’s safe to edit or if you should wait. (This feature is only available when Drive File Stream is installed). Safe to edit: No one else is editing. Wait to edit: Other people are editing, so your edits will create multiple, conflicting versions. New version created: Another editor saved a newer version of the file. New version created (conflict): While you were editing the file, another editor also edited it. Click for a side-by-side comparison to help you create one version. If version conflicts do occur, ‘Real-Time Presence’ will alert you and the other user to help avoid version conflicts. Drive will then display the two versions of the document along with their changes side by side. This helps you to quickly merge the different versions into one final document. If you would like to find out more about working with Office files in G Suite, or would just like to learn more about G Suite and what it can offer your organisation, please don’t hesitate to get in touch via info@cobry.co.uk. We would be delighted to have a chat about how we could help. Next Post Team Drives: What they are and how to use them.